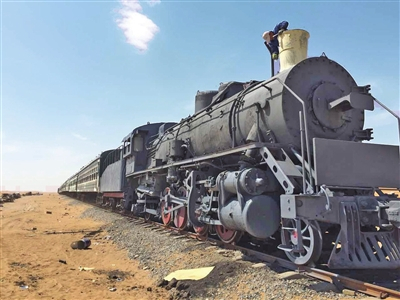 A desert themed steam train hotel is now under renovation at the Golden Sand Sea Tourist Site in Tengger Desert, Zhongwei City, Ningxia Hui Autonomous Region, on April 7. A desert themed steam train hotel is now under renovation at the Golden Sand Sea Tourist Site in Tengger Desert, Zhongwei City, Ningxia Hui Autonomous Region, on April 7. It is expected to receive tourists at the end of June this year. The retired steam train was used when China’s first railway built in the desert from Baotou to Lanzhou was launched in 1958. The steam locomotive and 17 carriages will be renovated into a hotel with bars, bathrooms and 130 beds. The Tengger Golden Sand Sea Tourist Site was open to the public on May 1, 2015 and has received 80,000 tourists by the end of last year.